Well Hung is an art gallery and framing workshop based in the creative hub of the East End of London. Our Shoreditch art gallery focuses on contemporary, urban and street art. Our extensive in-house workshop hones in on bespoke picture framing and Fine-Art printing. Our passionate and friendly team have decades of experience in the print, frame and fine-art industries and are known for producing work of the highest quality. We are delighted to announce ‘Still Waters Run Deep’, Dale Grimshaw’s second solo exhibition at Well Hung Gallery. The show features a new series of stripped back portraits, which depict threatened indigenous communities, particularly those from Papua New Guinea. For the past 5 years, Dale Grimshaw has been exploring the relationship between tribal people and the increasingly callous profit led world of globalisation. 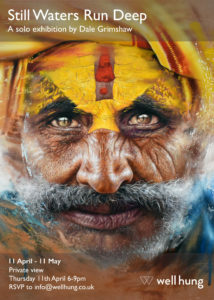 Dale has done this by juxtaposing powerful portraits with symbolic contemporary imagery, contrasting the old with new worlds. The new body of works in ‘Still Waters Run Deep’ focus on the simplicity of the individuals, their purity of expression, strength and beauty, concentrating on the intricate detail and reveling in the expressive possibilities of painting in oils. Most of the works find the strong faces framed by abstract brush strokes, implying movement, from which they emerge in magical stillness. The colour palette is simpler now and there is a sense that the artist has become completely at one with his subject matter. These are works of beauty and maturity achieved as a result of total immersion and empathy for his subjects. Dale has had many solo shows in London and recently one in Stockholm. His work has been shown all over Europe and in the USA. He is also one the UKs most acclaimed street artists, constantly in demand to paint murals across the globe. Please join us on Thursday 11th April for a private view from 6-9pm. Music and refreshments will be provided, the event is open to all but please do email info@wellhung.co.uk to confirm attendance. Admission is, as always, free.